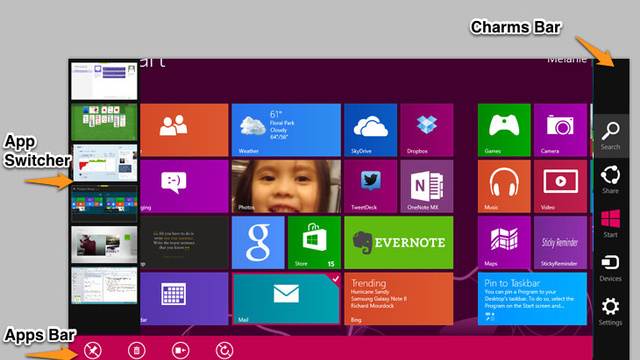 The first challenge is to just get into Windows 8. The lock screen you see when your computer starts up doesn't have any login options. To get past the lock screen and log in, you can swipe up from the bottom or, with your mouse, click on the bottom edge and drag up. 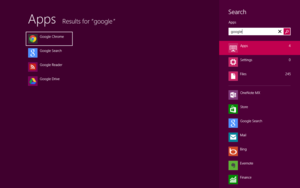 Now you're in the new tile-based interface, which used to be called Metro. Think of the colorful start screen as the replacement for the traditional start menu in Windows 7 and earlier—just laid out in a grid and with new tablet-optimized apps from the Windows App Store. Navigate the horizontal menu by swiping to the right or left, click and dragging with a mouse, or using the scroll wheel on your mouse. 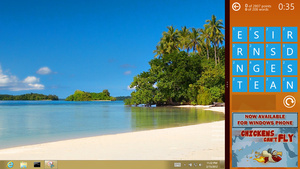 New full-screen Windows 8 apps (a.k.a. Metro apps from the Windows App Store) and desktop apps all have shortcuts here. To tell the difference between them: the Windows Store apps are customized, colorful tiles, while the standard desktop apps (e.g., Windows Explorer) just have a plain generic design used by every other standard desktop app. To manage these tiles on the start screen: Right-click, swipe down from the top of the tile, or press the little menu key on your keyboard with the app selected to bring up options like uninstalling the apps or unpinning them from the start screen. If you remember just one keyboard shortcut, this should be it: Win+C. 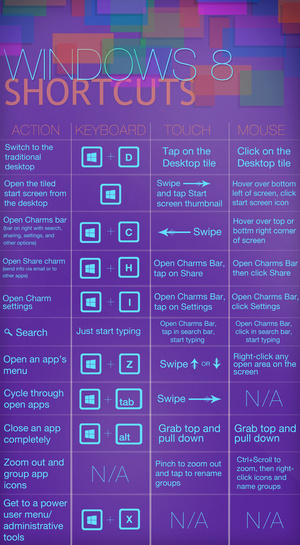 This brings up the Charms panel with quick access to searching, sharing, and settings functions. Other ways to bring up the Charms panel include swiping from the right edge to the left on the touch screen, or pointing with your mouse to the top right or bottom right corner of the screen. Alternatively, you can hover your mouse over the top left corner and drag down on the thumbnail to see the list of running apps. Then click the one you want to get to. If you have a touch screen, you can also switch to the last-used app by swiping from left to right. The Apps Bar is a menu that opens on the bottom and sometimes top of the screen to present other options, depending on what app you're using or if you're in the start screen. It's the context menu akin to right-clicking. Open it by swiping down from the top or up from the bottom of the screen. You can also right-click anywhere with your mouse or hit Win+Z. To remove or unpin a tile from the start screen, either right-click to select it, press the menu key on the keyboard, or swipe down on the tile (a bit tricky). This will bring up options for managing the tile. By default Windows leaves those full-screen apps open. What if you want to close an app? The old Alt+F4 shortcut still works. Otherwise, drag the top of the screen (with your mouse or finger) and release the thumbnail on the bottom. The desktop you know and love in Windows 7 is still here, don't worry. To get to it, hit Win+D or tap/click the Desktop tile on the start screen. In most cases, you can simply start typing anywhere (in an app, the start screen, windows store, etc.) and the search panel will open. Special shortcuts for searching include: Win+Q for settings and Win+F for files. You can snap the normally full-screen apps to the left or right side while working in the desktop. (This only works on screens with at least 1366x768 resolution.) To do so: Swipe in from the left edge of the screen or move your mouse cursor to the top left corner and swipe down to show the thumbnails of your open apps. Select one and drag its thumbnail to the right until you see a dark grey snap bar on either the left or right side. Then release the thumbnail there to snap the app. For external monitor and projector options, hit Win+P or on the Charms panel, select Devices, then Second Screen. To print from a Metro app, open the Charms panel (Win+C, hover your mouse on a right corner, or swipe in from the right). Then select the Devices charm and select your printer. For more print options, click the More settings link. Windows 8 comes with a cool new screenshot shortcut: Hit Win+PrtScrn and the system not only takes the screenshot, it automatically saves it as a PNG file in your pictures folder (under a new Screenshots folder). If you have OneNote installed, Win+S lets you drag to create a screen clipping and save to OneNote. Hit Win+I to get to open the settings menu (or open the Charms bar and select Settings). What's on that menu will change depending on the app you're in or if you're on the start screen. The PC settings—like a simplified version of the control panel—is under the "PC Settings" button. Speaking of settings, under the PC Settings screen, you can customize the lock screen with a background image and also choose the apps that show notifications/information when the screen is locked. For example, you can have the Mail app show new emails or the Weather app show a forecast. Finally, shutting down the Windows 8 way requires a number of steps: Open the Charms Bar then click Settings (or hit Win+I), then the Power button, and select if you want to Sleep, Shut down, or Update and restart. You could also press Ctrl+Alt+Delete and hit the power button in the bottom right. 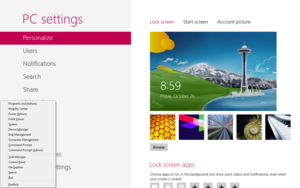 Or, better yet, add a shutdown button to your start screen with a shortcut. 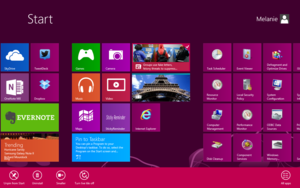 Hopefully these tips and shortcuts will help you get around Windows 8 much more easily. 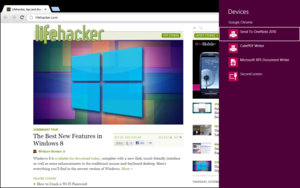 For a giant list of Windows 8 shortcuts, see this blog post on MSDN.